The Bank of England just published an already very controversial paper, titled “Money creation in the modern economy”. Scott Sumner, Nick Rowe, Cullen Roche, Frances Coppola, JKH, and surely others have already commented on it. Some think the BoE is wrong, some, like Frances, think that this confirms that “the money multiplier is dead”. Some think that the BoE endorses an endogenous money point of view. Many are actually misreading the BoE paper. To be fair, this might not even be an official BoE report, and might only reflect the views of some of its economists. That type of paper is published in many institutions. I am unsure what to think about this piece… They seem to get some things right and some other things wrong, and even in contradiction to other things they say. Overall, it is hard to reconcile. What I read was a piece written by economists. Not by banks analysts or market participants. Therefore, some ‘ivory tower’ ideas were present, though in general the paper was surprisingly quite realistic. Contrary to what some seem to believe, the BoE does not endorse a fully endogenous view of the monetary system, and certainly not an MMT-type endogenous money theory. Let me address point by point what I think they got wrong or contradictory (I am not going to address the points in the QE section, which simply follow the mechanism described in the first section of the paper). Well… You know what, guys? It was already the case in the pre-fiat money era… Banks also created broad money on top of gold reserves, thereby creating deposits, the exact same way they now do it on top of fiat money reserves. The only difference is the origins of the reserves/monetary base. They very often refer to Tobin’s ‘new view’. But they never mention Leland Yeager, who strongly criticised Tobin’s theory in his article ‘What are Banks?’ As a result, their view is one-sided. In their attempt to attack the money multiplier theory, they mistakenly say that the theory assumes a constant ratio of broad money to base money (page 2). There is nothing more wrong. What the money multiplier does is to demonstrate the maximum possible expansion of broad money on top of the monetary base. The theory does not state that banks will always, at all times, thrive to achieve this maximum expansion. I still find surreal that so many clever people cannot seem to understand the difference between ‘potentially can’ and ‘always does’. Moreover, the BoE economists once again contradict themselves, when on pages 3 and 5 to 7 they essentially describe a pyramiding system akin to the money multiplier theory! The paper also keeps mistakenly attacking the money multiplier theory and reserve requirements while entirely forgetting all the successful implementations of reserve requirement policies by central banks throughout the world (China, Turkey, Brazil…). The ‘Limits on how much banks can lend’ section is very true (though I might be biased given how similar to my posts this section is), and I appreciate the differentiation between individual banks and the system as a whole, differentiation that I kept emphasizing in my various posts and that I believe is absolutely crucial in understanding the banking system. Nonetheless, while their description of the effects of over-expanding individual banks and what this implies for broad money growth is accurate, it is less so in regards to the system as a whole. Indeed, they seem to believe that all banks could expand simultaneously, resulting in each bank avoiding adverse clearing and loss of reserves. This situation cannot realistically occur. Each bank wishes to have a different risk/return profile. As a result, banks with different risk profile would not be expanding at the exact same time, resulting in the more aggressive ones losing reserves at the expense of the more conservative ones in the medium term, stopping their expansion. At this point, we get back to the case I (and they) made of what happens to over-expanding single banks. What do we learn from this piece? For one thing, those BoE economists do not believe in the endogenous money theory. This is self-explanatory in the mechanism described in pages 5 and 6. They clearly know that an individual bank cannot expand broad money by itself. They seem to admit that the central bank does not have the ability to provide reserves on demand (despite saying a couple of times that the BoE supplies them on demand, another apparent contradiction). Their only qualification is that this can happen when all banks simultaneously expand their lending. This is theoretically true but impossible in practice as I said above. Why would the central bank not have the ability to provide those reserves on demand? Actually, it can. It’s just that there is no (or low) demand for those reserves. This is due to the central bank funding stigma, an absolutely key factor that is not referred to even once in this BoE paper. As a result, their description seems to lack something: if individual banks lack reserves to expand further, why aren’t they simply borrowing them from the central bank? By overlooking the stigma, their mechanism lacks a coherent whole. 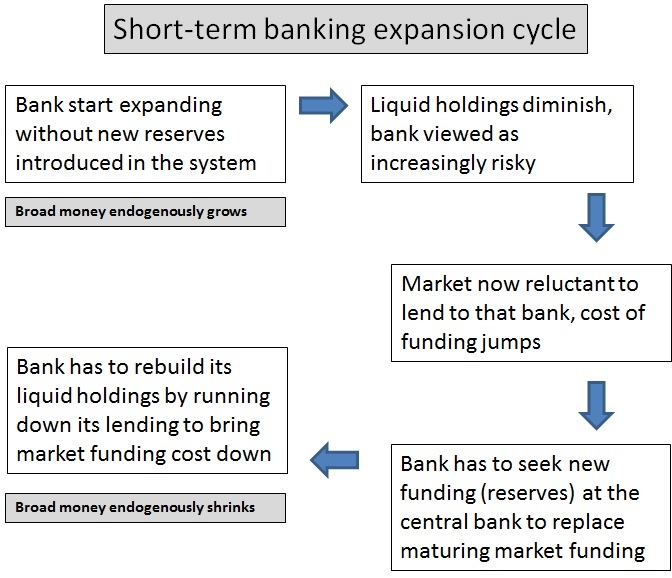 This is how things work (in the absence of innovations that economise on reserves): money supply expansion is endogenous in the short-term. But any endogenous expansion will also lead to an endogenous contraction in the short-term. In the long-term, only an increase in the monetary base can expand broad money. Only central bank injections free of any stigma, such as OMO, can sustainably expand the monetary base by swapping assets for reserves without touching at banks’ funding structure. I have a minor qualification to add to this mechanism though. The endogenous contraction does not necessarily always occur around the same time. A period of economic euphoria could well lead to lower risk expectations, allowing banks to reshape their funding structure and the liquidity of their balance sheet in a riskier way than usual before the natural contractionary process kicks in. In the end, the few ‘ivory tower’ ideas that are present in this research paper make it look incoherent and internally inconsistent. Central banks are notorious for their intentional or unintentional twisting of economic reality and history (see this brand new article by George Selgin on the Fed misrepresenting its history and performance. Brilliant read), so we should always take everything they say with a pinch of salt. I do like a good flowchart! Yep, flow charts are always nice but it’s always tough to include all the relevant and important details! Yep. Good to see someone bring in Yeager. Ok let’s do some real-world math. Currently, banks are holding a total of $75-Billion cash in vaults and accumulated deposit liabilities of $11-Trillion. What is the reserve ratio and the multiplier? How do banks loan from penniless liabilities? Bank reserves held at the Fed are in assets, primarily Treasuries and Agency MBSs, How is a money multiplier achieved from non-cash reserves?